Ms. Pivotte who is now the oldest woman in Grenada was also joined by Grenada’s first female Governor General, Her Excellency Dr. Cecile La Grenade. Ms. Pivotte who resides at the Gift of Love, Mother Theresa’s Home in St David’s was dressed in her finest as she celebrated her birthday that was described as a milestone in Grenada. Tokens of appreciation were provided by the Elderly Desk of the Ministry of Social Development. Her Excellency Cecile La Grenade was pleased to see the centurion in good health. Her Excellency presented a gift basket to Ms Pivotte. The token contained some goodies and toiletries. “This will make you enjoy life a little more, and may you have many more happy days in this Home”, the Governor General told Ms. Pivotte. Ms. Pivotte received flowers and more goodies from Minister for Social Development, Hon. Delma Thomas. Mrs. Thomas said, the flowers were to “brighten up” Ms Pivotte’s life. She thanked her for the contribution she made to Grenada. “We hope a lot of us could live as you do, but we really want to know what you did”, the Minister prompted. 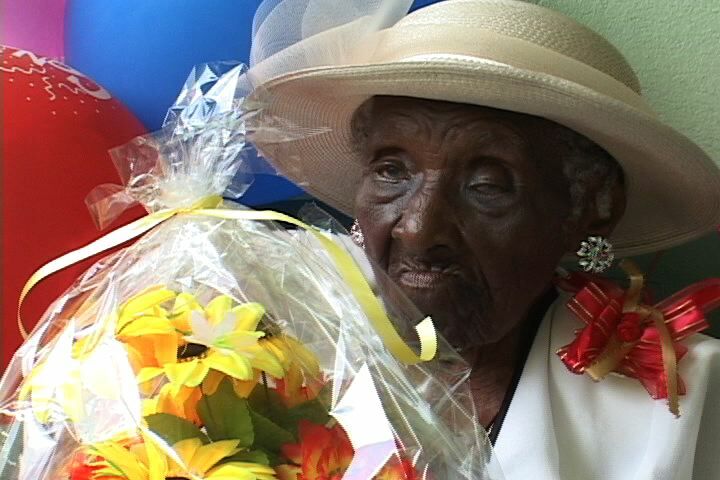 The 107 year old gracefully kept it a secret and Minister Thomas imagined that she lived a“good life”. The celebration included singing by the visitors and nurses at the Home.